This model is known to run in both PCEnv and COR. It recreates the published results, and is currently set up for a dual pulse experiment, with duration of 100 milliseconds. The model is relatively stiff, so maximum step size and number of steps might have to be adjusted to obtain discernible changes. Abstract: We present a mathematical model for calcium oscillations in the cilia of olfactory sensory neurons. 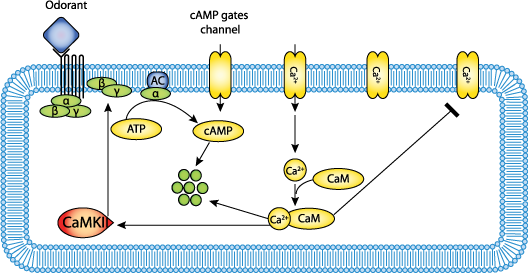 The underlying mechanism is based on direct negative regulation of cyclic nucleotide-gated channels by calcium/calmodulin and does not require any autocatalysis such as calcium-induced calcium release. The model is in quantitative agreement with available experimental data, both with respect to oscillations and to fast adaptation. We give predictions for the ranges of parameters in which oscillations should be observable. Relevance of the model to calcium oscillations in other systems is discussed. Derived from workspace Reidl, Borowski, Sensse, Starke, Zapotocky, Eiswirth, 2006 at changeset ca129b34676c.